The Best Product to Save Your Time and Money! Great for the removal of inner panel, instrument panel, garnish/trim, console, roof lining and more, a great helper for DIY Auto Repairing. Remove trims, moldings and interior trim without scratching your finish or damaging your trim. Super light, can save more time and effort for car trimming, easy to use. Welcome to our store! Enjoy quality and healthy life! We dare to use the new, heart, innovation to supply the best quality products! Any problem please feel free to contact us first so that we can supply the best service for you. These panel trim removal tool kits perfect for installing and removing audio equipment, door and window trim, moldings, panels, dashboard and clips. Unique anti-scratch design, with ergonomic handle to save time and effort, easy to use. Durable Material: Made of impact resistant nylon fiber material, with matte surface treatment, tougher than common ABS one, it is eco-friendly, non-toxic and breakage-proof. 8 Different versatile trimming tools, auto upholstery tools for hard to reach spaces and crevices.Also works great for furniture repair soft and hard woods,upholstery,leather work etc. 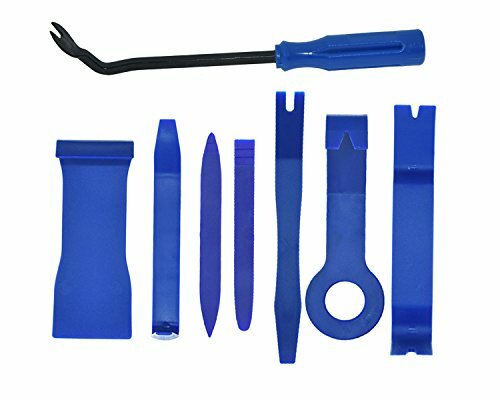 There are 8 pcs different kinds of trimming tools, including 7 pcs car door panel removal tool and 1 fastener remover to facilitate your needs when repairing. If you have any questions about this product by Antrader, contact us by completing and submitting the form below. If you are looking for a specif part number, please include it with your message.